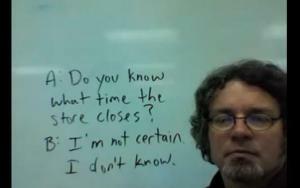 This teacher gives a short lesson about when to use "during" and when to use "while." 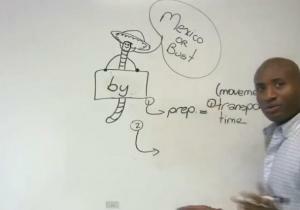 To check your comprehension of the lesson, there is a quiz after the lesson. Excellent lesson for confusing words. A free lesson from a teacher online. 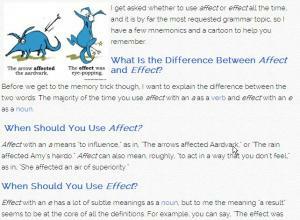 This lesson is about the confusing words "affect" and "effect" and how they are different. 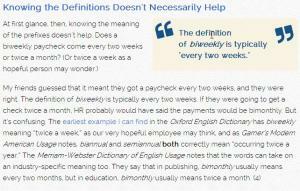 Excellent explanation for these confusing words that will help you to remember the difference. What is the difference between "sometime" and "sometimes?" 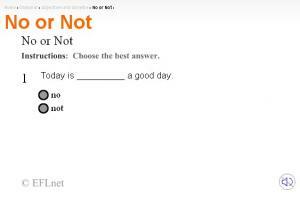 You will know after this online lesson with a teacher. Check your understanding with a quiz. You can ask the teacher questions on a public message board if you are still confused. Words that sound the same but have different meanings are very confusing. 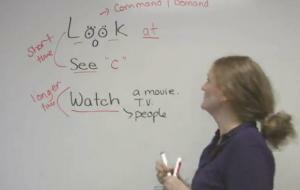 A teacher gives a free lesson about the difference between "to," "too" and "two." Take the quiz to check your understanding after the lesson. You can send questions to the teacher if you are not clear. A clear explanation about this common error in English. A free lesson that explains these two confusing words and helps you to never make this error again. The teacher gives you a quiz, then you can check your understanding with another quiz. Words that are pronounced the same are difficult for ESL students. In this free online class, you can learn about the difference between "who's" and "whose." You can ask the teacher questions on the message board. 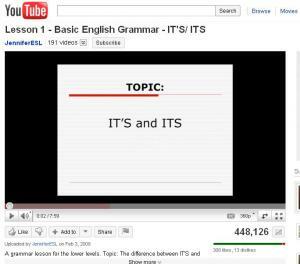 Well made YouTube video explaining the difference between it's and its. Offers a lot of native speech with some subtitles. The verbs "do" and "make" are easily confused. 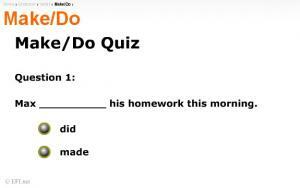 This lesson gives tips on how to remember which verb to use, including different expressions for the verbs. After the lesson, take the quiz to test your understanding. Essential for beginners. 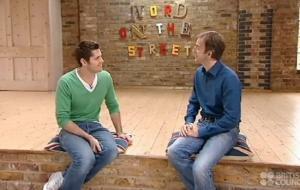 Did you start learning English several years ago or several years before? 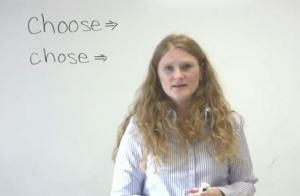 In this free lesson, you will learn the correct usage of these commonly confused words. Is it possible to make a mistake when these two verbs are actual opposites? Yes, it is, but not if you watch this English lesson! Take the free quiz after the lesson to test yourself. By the time you finish watching this free English lesson, you’ll know the difference between buy, by, bye, and bi. Confused? Watch and learn! 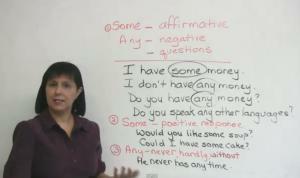 This is a video lesson about the easily and often mixed-up verb “have”! Are you listening? Can you hear me? 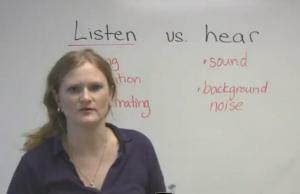 What's the difference between LISTEN and HEAR in English? Watch this free lesson to find out, then take the quiz to see if you got it. It is an exercise on 'No' and 'Not'. 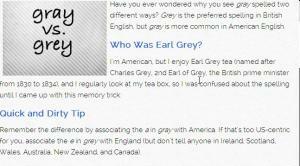 Learn the difference between commonly confused words "grey" and "gray". Improve your writing with a tip from Grammar Girl! Well made video about the use of "in" and "on" with time. Learn the difference between two of the most commonly confused words in English, "like" and "as". Follow along with the transcript as you listen to the podcast! 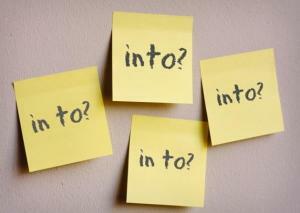 Learn the difference between the frequently confused words "in to" and "into" in this article. Take a tip from Grammar Girl! An exercise on 'make' and 'do'. There are certain words in English that are confusing because we spell them the same, they sound the same, but they don't mean the same things. These words are called homonyms. 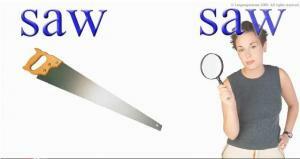 Saw is a homonym, as is rose, and countless others. 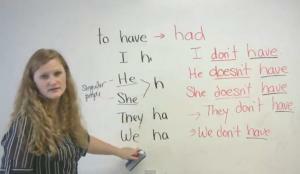 This video lesson introduces some of these homonyms and helps with your understanding and pronunciation. In this English lesson you will learn the difference between the homonyms here and hear. They sound the same, but mean something different! Homonyms are words that sound the same, but have different meanings and spelling. The three words 'they're,' 'their' and 'there' sound alike, but mean different things. 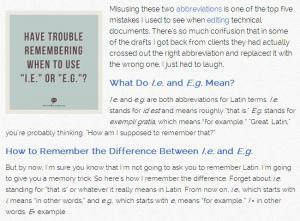 You don't want to confuse them in your writing! Advice & Advise — What’s the difference? One is a verb and one is a noun. 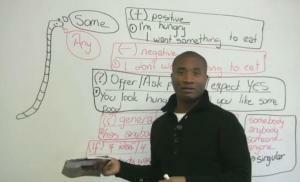 If you don’t know which is which, you need to watch this English lesson! 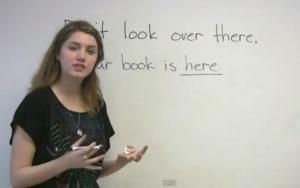 Watch this grammar lesson to learn the difference between SINCE and FOR, and how to use them correctly in English. One is related to the present while the other is not. 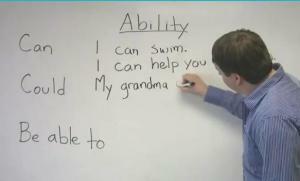 Expressing Ability with "Can," "Could" and "Be able to"
In this English lesson, I look at how to use can, could, and be able to, when talking about ability. 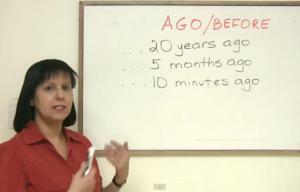 The ESL lesson explains which term is appropriate, depending on if you’re talking about the past, present, or future. Learn the difference between the two commonly confused words "affect" and "effect" in this podcast. Follow along with the transcript as you listen! Is it the same to collaborate on something and cooperate with someone? Well, no, it isn't. Learn the difference and speak more confidently in business. LOSE or LOOSE? This vocabulary lesson is about one of the most common spelling mistakes made by students. 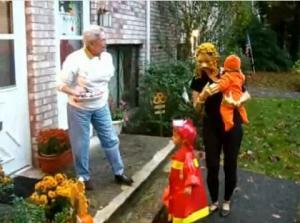 Watch this video and you won't go wrong again. Three common words that are frequently confused are: whom, whose and who's. Similar in both pronunciation and spelling, these words function very differently. This study lesson helps you to understand the difference between these words. Exercises are included for practice. Learn the difference between commonly confused words "phenomena" and "phenomenon" in this podcast. Listen and practice using the Grammar Girl examples! 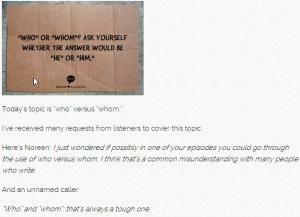 Learn the difference between the easily confused pronouns "who" and "whom" in this podcast. Follow along with the transcript, and look for Grammar Girl's trick for remembering these words! Homophones are words that sound the same, but mean different things. There are a lot of these in English, and they can be very confusing. 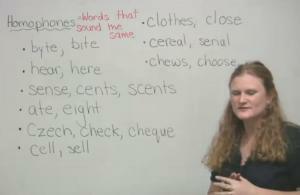 In this lesson, you will go over nine common sets of homophones: byte / bite, hear / here, sense / cents / scents, ate / eight, Czech / check / cheque, cell / sell, clothes / close, cereal / serial, chews / choose. Borrow, Lend, Rent or Use? 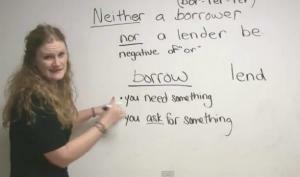 This lesson teaches you how to use these words properly in English: borrow, lend, rent, and use. Words in this group are often confused with one another. After you see this video you will know which one to use! 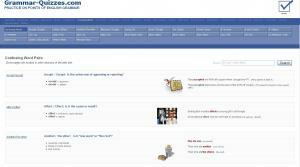 Common English Errors: Some or Any? The words “some” and “any” are used frequently in English. One is for negative situations and the other for positive or affirmative situations. Are you using them correctly? Watch this lesson to be sure. This English lesson outlines the difference between “used to” and “I’m used to”. I’m used to hearing ESL students confusing these two, so watch this lesson and learn the difference! What’s the difference between SOMEone and ANYone? There is a difference! Take this grammar lesson and find out. So many students mix up the noun and verb forms when speaking about choice! Now, you can learn the difference. This is an alphabetical and searchable list of words that are commonly confused. Examples include: effect/affect, dependant/dependent, can/may and many more. All explanations are thorough with plenty of examples and a short self-test. 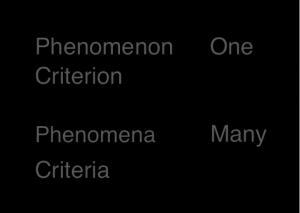 What is the difference between these two terms, "certain" and "certainly"? They sound similar and are both affirmative, but they are used quite differently. Watch this simple grammar video lesson to find out more! 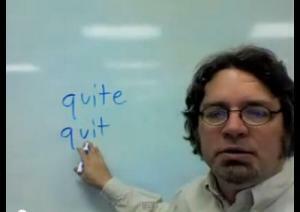 This grammar video lesson reviews the pronunciation and usage of "quite" as compared to similar words, like "quit" and "quiet." This is a very useful word for formal conversation, so watch the video! 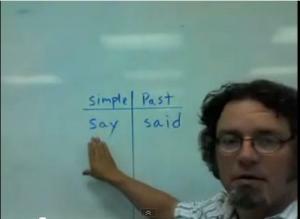 Perfect your pronunciation and usage of the verb "say" in all tenses by watching this video grammar lesson. Even advanced students often make mistakes with this verb, don't be one of them! In this English lesson, I cover the words WISH and HOPE -- what they mean exactly, and how and when to use them properly. Don't forget to take the free quiz to test your understanding of the lesson. Want to know how to talk about things you have completed, and ones you have not yet completed? This grammar lesson will help you understand when to use "already" and "yet" properly to sound more like a native speaker! 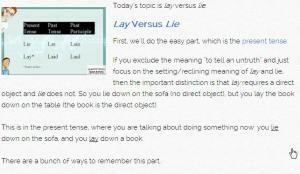 Learn the difference between commonly confused words "lie" and "lay" in this podcast. Follow along with the transcript to learn even more vocabulary! 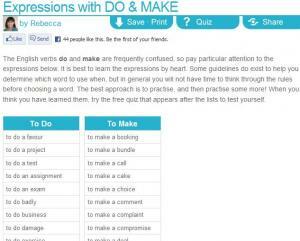 This page tries to explain the difference on verbs "do" and "make" with examples. There is a quiz at the end. "Being" and "been" sound similar in pronunciation, but their grammar structures are very different. A teacher explains the grammar of these two confusing words. If you have a question for the teacher, you can ask the question on the message board. 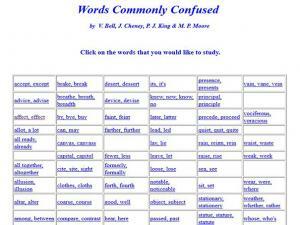 List of commonly confused words and phrases with detailed explanations and examples. 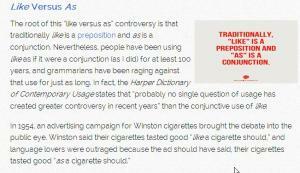 Learn the difference between these two frequently confused words as you listen to the article. Follow along with the transcript to pick up more vocabulary! 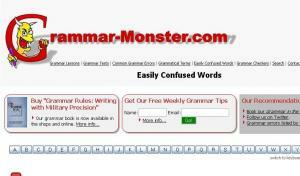 A great resource that helps you with words that are commonly confused. Pick on any pair from the grid and read the examples for each word. Practice your understanding by answering the questions that follow.